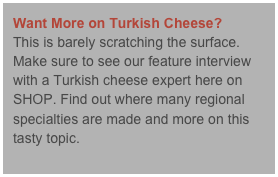 In the first article featuring Turkish cheeses, we will explore the most common varieties around Turkey. You will find these in any region, town and city of Turkey, widely sold and popular among the Turkish consumers. The king of the Turkish breakfast table, this white cheese is the indispensable staple of the Turkish breakfast, and even dinner tables across the country. One cannot think of Turkish breakfast without white cheese, a cheese similar to “feta”. Made from sheep’s milk, this cheese also known as “Teneke peyniri” or tin cheese as it is made and sold in tins, is mostly crumbly in texture, salty and quite white as its name states. Turkish housewives commonly leave the store or market bought cheese in water to remove some of the salt before serving. On the breakfast table, the cheese is the perfect accompaniment to slices of cucumber, tomatoes and some olives. It is the most popular ingredient for the savory pastries (börek) of Turkish cuisine. In addition, white cheese takes its place at the rakı (traditional Turkish alcoholic beverage, also known as “lion’s milk”) table, along with a wide variety of simple and tasty meze’s (tapas or small appetizer plates). Two towns in Turkey, Edirne and Ezine (near Çanakkale) are famous for their white cheese and you may see the popular and famous white cheese also sold under the name of “Edirne” or “Ezine” giving it the region’s name. Old or aged (eski) and fresh (taze) kasseri or kasar cheese is another staple of the Turkish table. Kasar, a yellow, semi firm cheese made from sheep’s milk is a popular choice for sandwiches as it can be sliced and melted nicely with its relatively firm consistency. Fresh kasar is a great choice for the pachanga borek. it is also the popular choice for Turkish toast, or “pane” (fried cheese, first coated with egg, then breadcrumbs and fried). Tulum means sheep’s skin or simply, skin in Turkish. The cheese made with sheep and cow and some times, goat milk takes its name from the method of its production. The milk curd is let to rest in animal skin during its preparation. 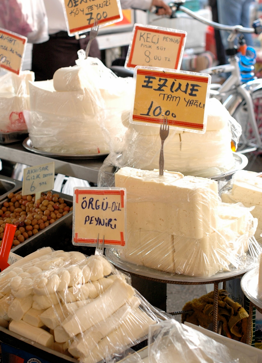 The cities of Erzincan and Izmir are among of the key cities famous for their tulum cheese. Most commonly, you will find this cheese served at larger restaurants before a meal, alongside fresh butter, walnuts and a warm pide (Turkish fluffy bread similar but puffier than the pita bread). It is hard to resist but many of us simply can’t resist to stuff ourselves with this delicious spread even before the waiter takes down our order for the main meal. •In parenthesis next to the name of each cheese, when possible, the English name of the cheese will be provided, especially if it is sold outside of Turkey. •Peynir or Peyniri means “cheese” or “cheese of” in Turkish. You will note that many of the Turkish names of cheeses end with that word. •Many cheeses are recognized with and named after the name of the city of the region where they are made. As one would expect, a country of agriculture and husbandry like Turkey also has a good selection of cheeses. However, in the world of cheese already exciting and full of adventures with varieties and wonderful tastes like French brie, Spanish manchego and more, Turkish cheese often gets overlooked. Many know about the white cheese (also known in Turkish as beyaz peynir) but many other regional specialties go unrecognized. In this new series dedicated to Turkish cheese, we hope to bring you a bit closer to this country’s wonderful cheese varieties and how they are made and enjoyed by its countrymen. Ready to explore?